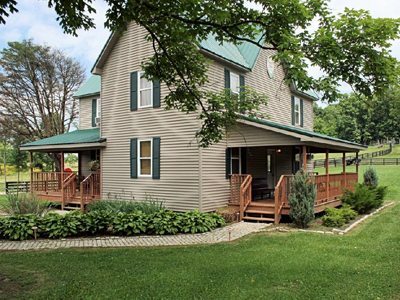 The Main Guest Lodge is a restored 1890s barn with a banquet hall, pool & ping-pong tables, wide screen HDTV for videos and satellite TV, bar and grill deck. Seats up to 120. Banquet Hall seats up to 60 with space for additional 40 on covered indoor/outdoor deck. Large Commercial Kitchen facilities, and the Grain Bin Theatre Gym. 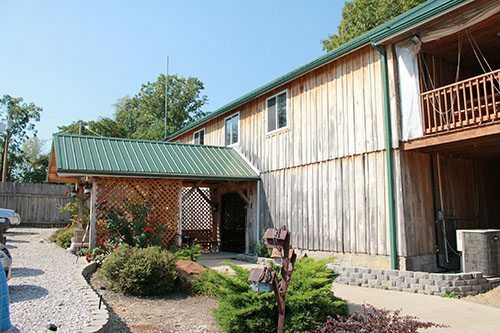 3 private rustic queen rooms and bunk room with upper loft level with access to lobby & one upper level full bath plus men’s and women’s bathroom on main floor with showers. Ground level queen with an in-room laundry and sauna. Elk Ridge offers the Blanche House Bed & Breakfast as the entire vacation cottage unit or as separate individual room rentals. Located 9 miles from French Lick, Indiana. The restored 1910 country farm house includes 3 Queen Suites with private baths and one King Suite with a whirlpool garden tub. Guest privileges include: Access to guest lounge, full commercial kitchen, and grill deck at the Elk Ridge banquet hall (a short walk across the lot), plus open access to gym at the ranch, private golf, fishing, and hiking. Amenities include: microwave, small refrigerator, in-room air conditioning, and internet access, television satellite TV. No individual guest phones – guests have access to lobby phone. The Bunk Room Area in the Main Lodge has 9 Single bunks and access to shared baths or separate men’s & women’s baths. 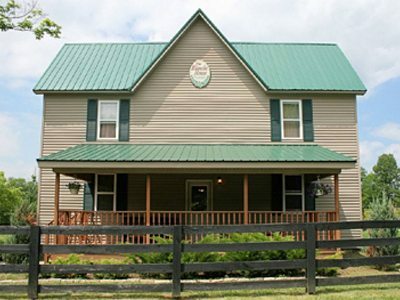 Hostel type lodging accommodations are the ideal retreat for hunters, camping groups, or overnight party guests at the Main Lodge. There are also 3 rustic, private queen rooms with access to two shared baths on the lower level and one full bath on the upper level. Plus there is a queen room on the ground level with a laundry and infrared sauna. The tier 3 upper loft has two more queen beds overlooking the banquet hall. 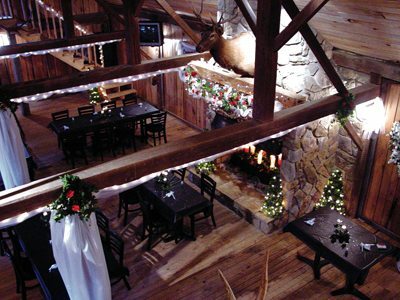 Whether you’re turning five or fifty-five, you can host your next birthday party or special event at Elk Ridge Ranch. 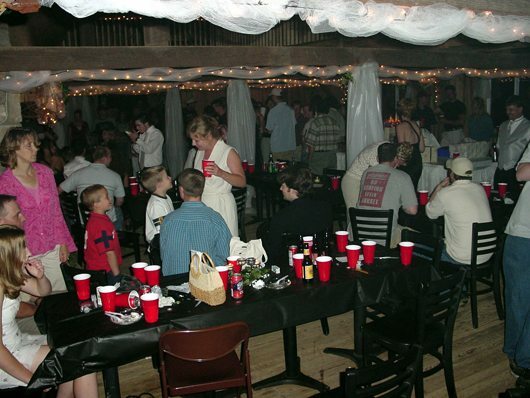 To schedule your private party, wedding, or other special event call Wendy at 812-295-6235. Downstairs from the Banquet Hall is a commercial kitchen with Vulcan Gas Range with 6 burners, a large convection oven, 3 compartment stainless steel sink, dishwasher, and three additional separate sinks for hand washing and cleaning stations. The ground level kitchen has a large dining table for 10 and the ground floor lobby dinette set seats 6. Larger group dining is upstairs in the Banquet Hall. The kitchen is fully equipped with utensils and place-settings for groups up to fifty. Additional dining items can be reserved for larger groups. Please inquire. The Butler Suite is a King Suite with a private bath. 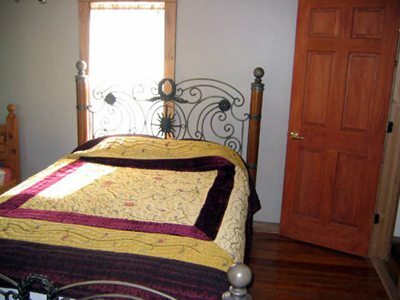 Comfortable bedding, a hand crafted wooden dresser, satellite TV, double sinks, shower, and whirlpool garden tub for two. View of golf course. The Blanche Room is a light-filled Queen Suite with a private bath. Comfortable bedding, satellite TV, bath with shower. View of the labyrinth and gazebo. 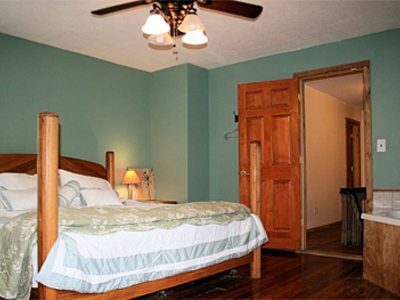 The Jones Resting Place is a light-filled Queen Suite with a private bath. Satellite television, bath with shower. 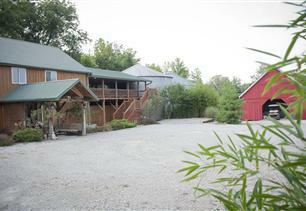 View of the Big Barn Lodge. Optimal lower level room for families with children since the kids can stay in the room across the hall. Satellite television, private bath, shower. View of the Big Barn Lodge. 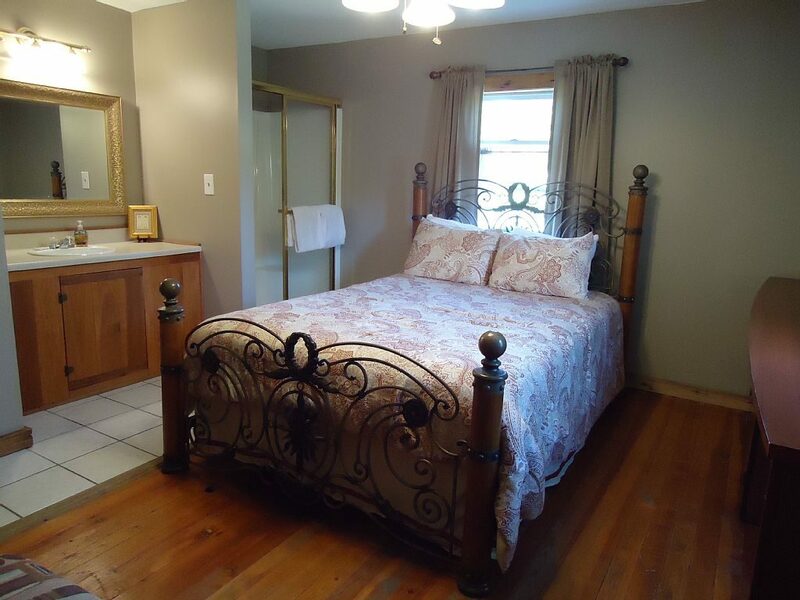 This room is perfect for kids or those that don’t mind sharing a bath with the room across the hall. One full double bed and single bed. Satellite TV.